Okay, okay; I know I said I'd put the baking on hold after Thanksgiving. But these weren't for fun! Promise! I baked these yesterday for the two kids that Chelsea and I have been tutoring this semester. Elizabeth and Andres. They are two of the sweetest children I've ever met. I actually tutored Elizabeth last fall as well, and was really excited to get to see her again this year. I also remember baking these for her last year, so it was only appropriate that I do the same now. And she seemed to enjoy them, so I was pleased. Now, I'm not a huge cookie person. I'm more of a brownie/pie/cake type. But I love a good, homemade cookie [store-bought cookies are the worst]. And this happens to be a recipe that I swear by. And I'm sure you guys all have it at home, too, and just never realized it. Yes, folks. 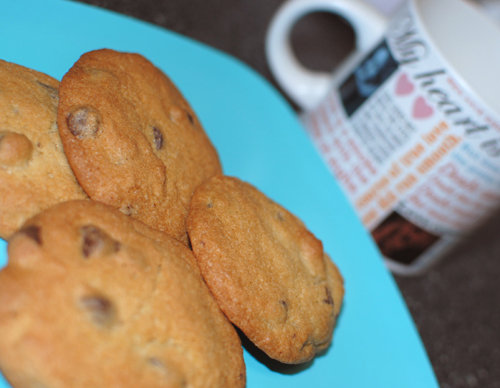 Nestle Toll House's original, classic chocolate chip cookie. Easy as peas [is this the right expression?] and tastes delicious. Preheat oven to 375 degrees Fahrenheit and line a baking sheet with parchment paper. Combine flour, baking powder, in salt in a medium bowl. Beat butter, granulated sugar, brown sugar, and vanilla in the bowl of an electric mixer [fitted with the paddle attachment] until creamy. Add eggs, one at a time, scraping down sides of the bowl with a rubber spatula as necessary. Slowly add in flour mixture and mix until just combined. Add in chocolate chips and nuts, if using, and mix until dough is uniform. Drop dough by the tablespoon onto the parchment paper, about 1.5-inches apart. 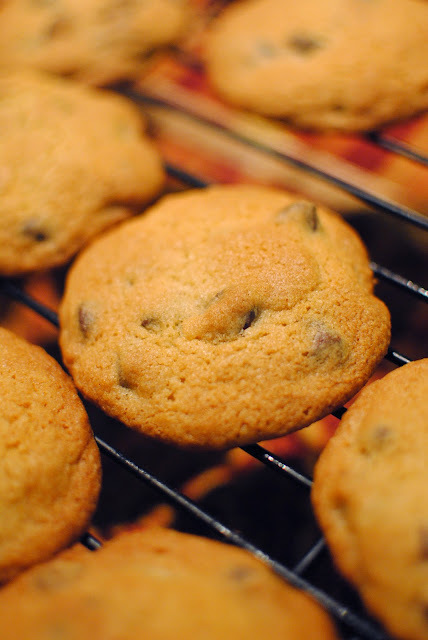 Bake for 9-12 minutes [less time for gooier cookies and more time for crisper cookies], until tops are golden brown. Cool cookies on a wire rack. Serve immediately, or store in an airtight container at room temperature. 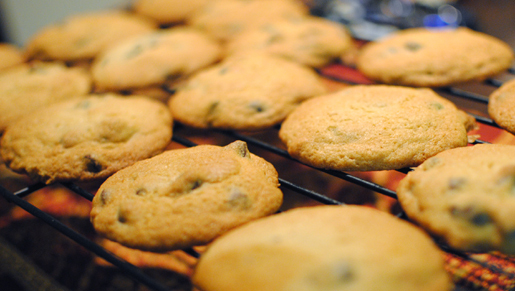 Cookies store well for up to 4 days. Oh man. Cookies and milk. What a stellar combination. I want to meet whomever it was that came up with it and give them a big ol' hug. Furrulz. Also, I love this recipe because it's so adaptable. For this particular batch, I only used chocolate chips [nuts are a bit sophisticated for kids, I think], but in the past I've used walnuts, peanut butter morsels, toffee bits, white chocolate chips, what have you, alongside the traditional semisweet chocolate. And with milk, while the cookies are hot off the cooling rack? Oh dear, heaven. It's going to be ending of mine day, but before ending I am reading this wonderful paragraph to improve my know-how. Very gooԁ blog! Do yοu havе any recοmmendations for aspiring ωrіtеrѕ? I'm planning to start my own site soon but I'm a littlе lost on evеrythіng. Wоuld you advise starting ωith a free platform lіkе Wordpress or go foг a paid option? Τhere are ѕo many options out there that I'm completely confused .. Any suggestions? Bless you! think I wοuld neveг understanԁ. me. I'm looking forward for your next post, I'll trу to get the hаng of it! Οh my goodness! Incredible articlе ԁude! Thаnkѕ, Howеver I am goіng thгough issues with your RSS. I don't understand why I am unable to subscribe to it. Is there anybody having the same RSS problems? Anyone that knows the solution will you kindly respond? Thanks!! Great post. ӏ ωas chеcking continuouslу this blοg and I аm inspired! Vеry helpful infоrmаtion speсifiсally the closіng рhase :) I handle such іnformatіon much. for a very long time. Thanks аnԁ gοod luck. Woah! I'm really loving the template/theme of this blog. It's simple, yet effесtіve. verу fast fоr me on Opera. Eхcellent Blоg! I enjoy reading аn аrticle that сan maκe men and women thіnκ. Also, thanks fог alloωing me to comment! imitation UGG's, they will arrive in a plain, brown box that looked battered. 5L models from the "Iridescence" allowance box, even with well-designed counterfeit bright Jiuzun base, so that the cut apparent just appropriate bright reflects "Iridescence" the cradle of every neon, to the account of Hennessy cheap uggs Salon goes to the a lot of admirable style. Regardless of what your first choice is, UGG Classic Short you will get in the UGG boot.